VTA plans to spend $200Million or more, to build a duplicate station in Santa Clara in order to get additional service frequency only for the short and un-crowded section between San Jose and Diridon. One reason given for VTA to build a duplicate rail station in Santa Clara next to Caltrain is that BART provides more frequent service. VTA is concerned that even with more cost-effective electric service, Caltrain won’t increase service frequency. Analysis shows that VTA could get more value for the money if they refrained from building the extra BART station, and used the money instead to increase Caltrain service frequency to match BART frequency in Santa Clara County from Palo Alto to San Jose. For BART to run extra service from Diridon to Santa Clara, it would cost about $7.4 million in operating cost per year, or about $220 million over 30 years. If VTA/BART decide to run two lines to San Jose/Santa Clara, it would cost about $12 million per year, or about $370 million over 30 years. Caltrain’s rough draft electric service plan calls for modestly increasing peak service to 6 trains per hour, and off-peak to every 30 minutes, costing an extra $5.7 million, not counting any savings from more efficient electric service. If Caltrain increased frequency to match BART, it would cost an extra ~$9 million above that per year, which would be $276 Million over 30 years. So VTA could get extra frequency from Palo Alto to San Jose, for $56 million (or a savings of $93 million, if BART chose to run two lines). 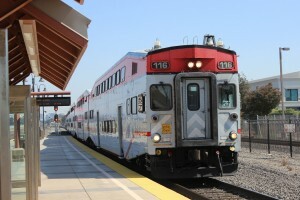 The Santa Clara extension, including the tracks, a railyard storage area, and a station, is expected to be in the $800 Million to $1Billion range. Leaving out the station would save ~$200 Million. So, if VTA refrained from building the duplicate station, and used some of the money to increase Caltrain frequency, they would save $140 – $230 million, and would provide more frequent backbone rail service in more of the county. The savings could be used to benefit the City of Santa Clara, by overhauling the Great America light/heavy rail station which could do a much better job reducing traffic at the largest development ever in Silicon Valley, which is currently proposed to be car-dominant. What do you think? Should VTA build a duplicate station in order to get more frequent service, or use a fraction of the money to increase Caltrain frequency, and use the savings for non-redundant transit improvements? I think the best use of money would be to build the Santa Clara station (with a people mover connection into SJC terminals) AND continue it up to Great America. BART to Great America would instantly transport thousands upon thousands of people from central and south San Jose (via Diridon transfer) right into the heart of Silicon Valley. Long ago we voted to tax ourselves for a rail connection from Fremont right to Great America but that was yet another bait and switch that never was built even though the language was explicit in the ballot measure. Silicon Valley needs as many RAPID TRANSIT options as possible - light rail and Caltrain are not true rapid transit.